Is it possible to heat your house after your electrical has been disconnected because you were stealing power? Apparently so. This is a site revisited 44 days after the gas and electric were terminated, but the occupant apparently decided to stay and use alternate methods. Fire department suspects candles or careless smoking, but said it is still under investigation. Looks like it may need some additional work before the power and gas can be restored. A little paint, some curtains, good as new! Is this place considered rebuildable? Electure: Sheetrock has wonderful fire resistive qualities so the majority of the framing should be in great shape. 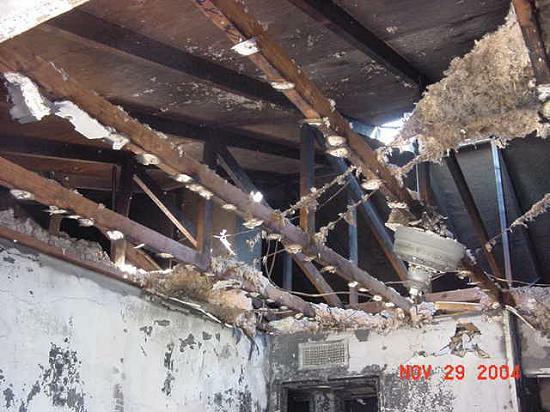 A few of the trusses may require replacement near the attic roof turbine where the fire vented. The main fire area appears to have been in a bedroom and adjoining bathroom, heat and smoke damge to the hall and adjoining rooms. They are looking at replacing the sheetrock where necessary, electrical may need replacement in the immediate fire area room and up in the attic, maybe some plumbing vents in the attic and new mechanical ducting if other than the old metal ducts were installed. 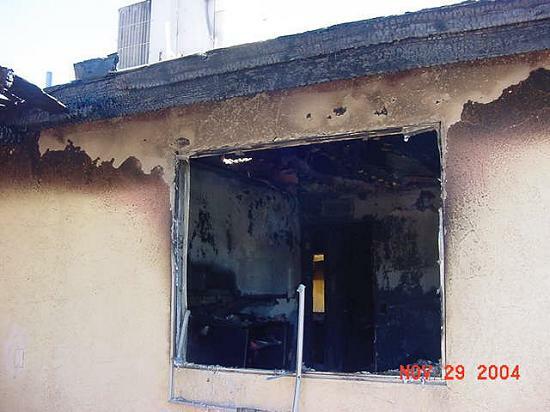 Very few of modern constructed homes sustain the kind of damage that requires demolition anymore provided the fire department has a good response time and early detection. 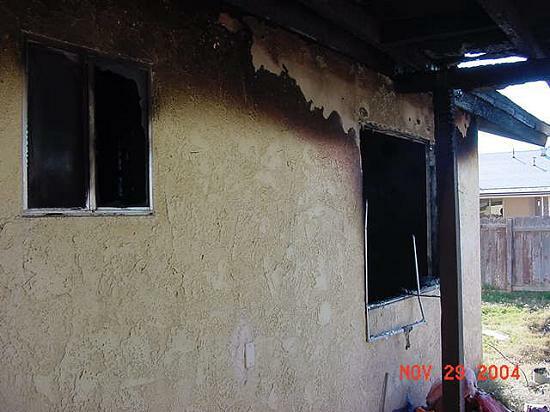 Most of these come out better than new in many cases, the owner's always seem to slip in some additional work that they have always wanted to do above and beyond the fire damage and the permit requirements assure that the work is done by licensed contractors in a case like this. As a Fire Officer, what I'd be looking at is damage to the structural members of the building. As in Roof Trusses, Framing of the walls and anywhere else where the strength of the total building could be compromised. A big part of this equation comes down to what the roofing material is made from, heavier materials like concrete tiles score a minus 5 (-5) here and We would close it off before the whole roof collapses. Trumpy: Understand your concerns extremely well, being a retired firefighter myself. Wasn't able to get into the structure to do any close up examination as the fire department had released the scene prior to my being made aware of the event. The fire department policy is to contact the on call building official and get a judgment call on the structural before they leave the scene. I generally am the last call if they can't find anyone else. In the years that I was with the fire service we would never have left a structure until we were assured that it was being secured, but that was then and things seem to be handled differently now. I get more information from the local newspaper than I do from my own departments. Nuff said. The roof looked straight and from what I could see there wasn't any deep char on the studs or roof members so I would say this house came out extremely well considering. In cases where the char is light and there is no structural problems I have seen the wood coated to seal in any odor and just the damaged areas repaired. If there is any doubt, a structural engineer is required to make the call. Biggest problem I have found is when the building division isn't involved the structure may be repaired, without permit by unlicensed contractors, and will never be inspected. For that reason, the utility companies become our most valuable assets when they require a city clearance prior to restoring the gas or electrical, and it gives us a heads up on what is going on.